This story is a collaboration with Steve Henn of American Public Media’s Marketplace. It was co-published with Salon. During the go-go years of the real estate bubble, shady mortgage brokers thrived, thanks to the sluggish response of regulators and law enforcement agencies. Amid the ruins of the crash, there’s a new boom attracting unscrupulous mortgage professionals: "Foreclosure rescue" companies promising — in exchange for a large up-front fee — to persuade lenders to modify desperate homeowners’ mortgages. And authorities are again finding themselves ill-equipped to deal with the deluge. In a giant game of whack-a-mole, law enforcement agencies at all levels across the country have filed suit against 150 such companies, but they continue to proliferate, and the number of consumer complaints continues to rise. "This is a very big scam," says California Attorney General Jerry Brown. "They’re all over the place, and as soon as you get one, they migrate to somewhere else." The case of one particularly aggressive firm, 21st Century Legal Services, shows just how ineffective authorities’ moves against the companies often are. Four states have sued 21st Century, and at least three more have open investigations. Over 150 consumers from more than 30 states have filed complaints against 21st Century with the Better Business Bureau. No active firm has more complaints. Yet the company forges on. Operating under a new name, Fidelity National Legal Services, it continues to solicit consumers nationwide, even in states where authorities have won court injunctions. Homeowners do not have to pay a company to negotiate on their behalf: they can always contact their mortgage servicer directly for a loan modification, at no cost. But consumers often find the process frustrating. For those who want guidance, nonprofit housing counselors approved by the Department of Housing and Urban Development will help for free. Consumers should especially be wary of companies charging up-front fees or touting guarantees. The Illinois attorney general says that her office has yet to see any such company operate within the boundaries of state law. Deception seems to be at the heart of the business model. Internal e-mailsfrom an Anaheim-based firm sued in July by the Federal Trade Commission alongside the states of California and Missouri reveal a boiler-room sales operation where management motivated its "counselors" with commissions and "Rolex races." 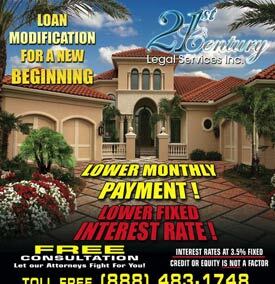 When the company’s operations manager wrote that the firm ought to inform clients that it couldn’t stop foreclosure, a sales manager, Feisal Cortez, replied: "If we say ‘WE DO NOT STOP FORECLOSURE’ we are going to lose 75% of our business. If they implement this verbage (sic) in customer service … excuse my language but WE’RE FUCKED!" 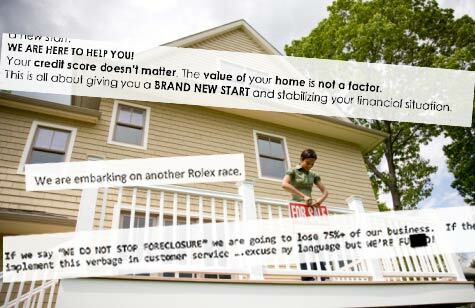 The ongoing suit charges that the company, US Foreclosure Relief, and eight associated firms deceived consumers. Steve Krongold, the lawyer for the firm’s owner, said there were "a couple errant rogue salespeople who lied in e-mails and on calls," but that the company had been making progress in modifying its customers’ loans when a court order in the case this summer allowed authorities to take control of the company. Real estate professionals and mortgage brokers are the driving force behind the boom. Indeed, some of the same brokers who stoked the housing boom are now making their living off homeowners stuck in the sort of toxic loans they peddled. "The mortgage brokerage business dried up, and so the same loans that they went out and originated, they’re coming in to try and modify," said Thomas McNamara, a former prosecutor appointed by the federal court to assess US Foreclosure Relief’s business. Take the case of the Southern California-based 21st Century Legal Services, and its president, Andrea Ramirez. In a lawsuit filed in federal court in California, former clients have accused Ramirez, then working as a mortgage broker, of fabricating documentation to support their application in 2006 for an adjustable-rate loan they couldn’t afford. Ramirez did not respond to multiple requests for comment. Ramirez’s lawyer, Kathleen Moreno, responded only with a statement that she’d been "informed of hundreds of positive statements regarding [21st Century’s] services." Since no one from 21st Century or Fidelity National Legal Services would answer questions about the company, it’s impossible to verify such a claim. It does appear, however, that the company hasn’t even been able to prevent foreclosures for its own employees. Ruby Encina, a close business associate of Ramirez, was foreclosed on and declared bankruptcy in July. In her bankruptcy petition, she listed her occupation as "Customer Service," 21st Century Legal Services. Encina could not be reached for comment. In nearly a dozen interviews, recent clients of 21st Century Legal Services told the same story over and over again. Loan mod firms pull in clients via TV, radio, direct mail, Web sites, e-mail, and phone calls. 21st Century has used all of these avenues, but it has been most persistent in directly calling struggling homeowners. One homeowner complained that the firm had been calling three or four times each day. 21st Century’s pitch is particularly alluring, because it goes even beyond a guarantee to provide the "proposed loan modification." All of its potential clients get this letter,which goes so far as to detail what the new monthly payment (based on a rock-bottom interest rate ranging from 3.25 percent to 4.5 percent) will be and when it will start. Some think 21st Century is offering a refinancing. An undercover tape (MP3, transcript), made by the North Carolina attorney general’s office shows a 21st Century salesman in action. Over the course of the 18-minute phone call, the rep, who refused to give his full name, threw everything he had at his mark, from "30-year fixed or whatever kind of fix you need" to criticizing all those misguided homeowners who’ve tried to modify their loans "for free." Homeowners have paid the company anywhere between $1,200 and $6,700, depending on the size of their mortgage (or, sometimes, two mortgages). 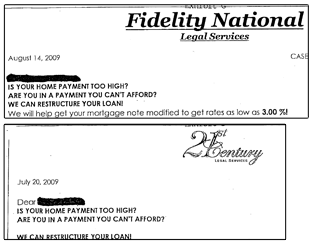 Many customers of 21st Century say they were told to stop mortgage payments. The company also instructs its clients not to contact their lenders about a modification, because "providing details regarding your modification to your lender may compromise the negotiation process," as a "Disclaimer Notice" given to clients puts it. It’s often months before homeowners learn that 21st Century made no attempt to negotiate on their behalf. Sometimes, that discovery comes via a foreclosure notice. When customers try to recoup their money, they’re given the runaround. One scammed homeowner in North Carolina said she’d called 21st Century 30 times trying to get a refund. After countless calls to 21st Century, Debbie Merritt of Collingswood, N.J., still hasn’t gotten her roughly $1,600 back. "Now when we get things in the mail that say ‘we can get you a modification,’ we just throw it away," Merritt says. ProPublica’s numerous attempts to get someone from 21st Century to answer questions about the company were fruitless. We were told management was busy with clients or everyone was in an "important meeting," or we were promised that someone would call in 10 minutes. No one ever did. The company has been similarly reluctant to answer questions from other news outlets – with the exception of NBC affiliate WCNC in North Carolina. A reporter at the station spoke with a man who identified himself as Mike Nehmeh, a lawyer at 21st Century. Nehmeh denied that the company had told any of its customers to stop their mortgage payments and called those who’d demanded a refund "crybabies." Nehmeh did not respond to our calls for comment. 21st Century has attracted plenty of attention from authorities, so how is it that despite all the letters, lawsuits and court injunctions, the company continues to operate? The fight against 21st Century and companies like it has been largely left to state law enforcement agencies, which have limited means and powers to stop them. Federal, state and local authorities have mainly attacked the problem through a combination of attempts to boost consumer awareness and through lawsuits, which typically seek to stop the company from operating in a single state. In April and again in September, the heads from HUD, the FTC, the Treasury and the Justice Department, along with state attorneys general, met and held press conferences about the "foreclosure rescue" boom. Collectively, the states have investigated at least 500 companies and filed at least 150 suits, according to statistics gathered by a working group of attorneys general. The FTC has filed suit against 22 companies since February 2008. By the end of July, court injunctions prevented 21st Century from operating in Arkansas, North Carolina, Ohio and Indiana. Yet it has largely ignored the injunctions. In three of the states – Arkansas, Indiana and Ohio — it has continued to operate, just under the new name Fidelity National Legal Services. Fidelity is registered at the same address as 21st Century. Its pitch letter to consumers is identical to 21st Century’s. It even appears to share the same employees. The Arkansas Securities Department has filed three separate actions after court orders failed to stop solicitations in the state, the third filed against Fidelity National. Finally, this month, a judge permanently banned 21st Century from the state and ordered the company to pay $130,000 in fines. But it is difficult for Arkansas to pursue a California-based company, even to enforce a court-ordered fine. Currently, only about half of states have laws that impose constraints on "foreclosure rescue operations," according to a July report from the National Consumer Law Center. These typically ban up-front payments. The FTC is currently considering proposing a rule that would ban up-front fees to "foreclosure rescue" companies nationwide. In a comment letterto the FTC about the proposed rule, the National Association of Attorneys General said it would "provide a means to end piecemeal enforcement actions." Deborah Hagan, the chief of the Illinois attorney general’s Consumer Protection Division, says such a rule would allow state law enforcement to obtain nationwide injunctions against firms like 21st Century in federal court, pool resources with other states, and make judgments easier to enforce. Many "foreclosure rescue" companies such as 21st Century also use a loophole that allows attorneys to collect up-front fees. "All that stuff on the news about fraudulent companies asking for money up-front is a bunch of garbage," says the 21st Century salesman on the undercover tape. "We ask for a percentage up-front because it’s a retainer fee for our attorney." Many state laws, including California’s, have such an exemption. The National Association of Attorneys General has urged that all up-front fees should be barred without exception for lawyers or anyone else. Hagan said such a blanket ban would help send consumers a clear message that up-front fees are a red flag. An FTC spokesman said he couldn't say when the FTC might issue its rule. Meanwhile, authorities say that the number of consumer complaints about these firms continue to rise. The boom dates to at least 2007, said Alison Southwick of the Better Business Bureau, when the BBB issued its first warning about "foreclosure rescue" companies. "At the time, there were a handful of companies that were producing hundreds of complaints across the country," says Southwick, but since then, there’s been an explosion. "Now we’re seeing hundreds and hundreds of companies producing a handful of complaints each." More than 730 foreclosure rescue firms have set up shop in Southern California alone, according to the BBB. Southwick and others attribute the success of the firms mainly to the increase in delinquencies and foreclosures. But consumer advocates also say the failure of mortgage servicers to deal with the volume of troubled homeowners has helped drive consumers to foreclosure rescue firms such as 21st Century. "For people who are desperate, who’ve tried and tried to contact their servicer, this type of scam can get some traction," says O. Max Gardner III, a bankruptcy lawyer in North Carolina. "At least you’re talking to a real person." "Because of the vulnerability of homeowners facing foreclosure, they’re easy pickings for those who would exploit the situation," says Brown, the California attorney general. In August, his office unveiled a Loan Modification Fraud Web site, complete with consumer tips to avoid being scammed. It also demanded that 27 loan consultants, 21st Century among them, justify suspect marketing claims. Brown says 21st Century hasn’t responded to the order. Read the internal emails and documents related to this story. Emily Witt contributed reporting to this story.